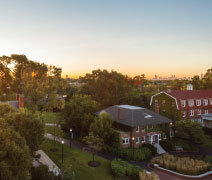 Founded in 1891 by the Evangelical Covenant Church, North Park University is located on Chicago’s North Side and enrolls 3,200 students from around the world. At North Park, excellence implies not only a deep tradition in the liberal arts and Christian faith but a spirit of reaching out to serve and learn from the dynamic community around us. The University adopts its setting as a place of learning; with endless learning opportunities, the city truly is our classroom. 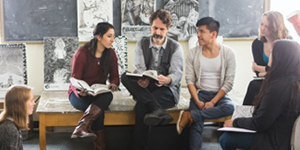 Within this framework, the University educates students from diverse backgrounds, cultures, and prior academic experiences, practicing Christian hospitality with students of all faith traditions while staying centered in the Affirmations of the Evangelical Covenant Church. North Park graduates leave equipped to change the world for the better, crossing cultures and advancing their faith. Our 34,000 alumni lead lives of significance and service in 54 countries. The Johnson Center for Science and Community Life (LEED Gold certified) is a hub where students learn and experience science, technology, engineering, math, and health-related fields in state-of-the-art labs and facilities. Here students also connect with resources including the offices of Career Development and Internships, University Ministries, International Student Services, and Student Success. Students can recharge, socialize, and study in the atrium, lounges, and prayer room. The North Park University Vikings represent North Park in intercollegiate NCAA Division III competition. Whether playing at home or away, in the fall or spring, our student-athletes represent the University’s commitment to preparing students for lives of significance and service as they learn teamwork, dedication, and how to be a positive example for the campus, their communities, and other teams. Applied academics programming at North Park provides opportunities for hands-on experiential learning, where students exercise critical thinking in real-life settings, all while receiving focused attention from faculty and staff. Students interested in deepening their Christian faith within a diverse community can be part of the living-learning cohort CRUX. 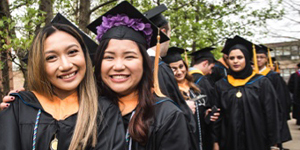 Through these programs, students at North Park become better acquainted with their career interests and form relationships with faculty, peers, and potential employers for internships and jobs post-graduation. Catalyst 606__ is North Park’s Chicago-based curriculum. Catalyst 606__ courses are regular credit-bearing courses that have at least two Wednesday afternoons per semester for learning outside the classroom, exploring the city during faculty-guided group excursions. You’ll engage the city through applied academics, serving, and learning from the diverse people of Chicago.